[굿닥터] 가치 있는 일을 위해선 때론 무모한 것도 필요한 거죠. and the board’s president asks why he wants to be a doctor. 소아외과 의사가 되려는 이유가 뭐에요? But what’s the reason you want to become a pediatric surgeon? It’s because of my rabbit and brother. 토끼가 제 앞에서 하늘나라로 갔습니다. My rabbit went to heaven in front of me. 형아가 제 앞에서 하늘나라로 갔습니다. My brother went to heaven in front of me. 둘 다 어른이 되지 못하구요. Both of them couldn’t become an adult. I wanted to help them grow up to be adults. 그래서 아이를 낳고 그 아이를 사랑하게 해주고 싶었습니다. Then I wanted them to have children and to give love to their children. 제가 어릴 적 있었던 보육원 아이들에게 3D TV를 선물해 주고 싶습니다. I want to gift a 3D TV to the kids at the orphanage where I stayed. 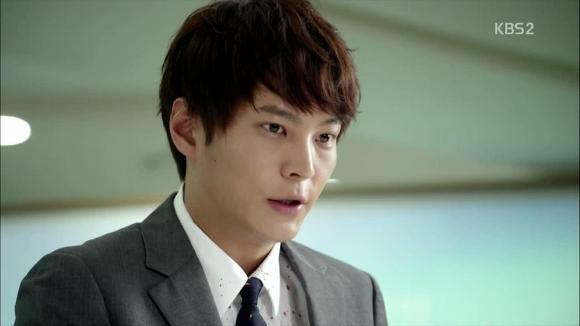 After the board meeting, president Lee worries that Doctor Choi is being reckless. 이여원: 그렇게 무모하신 거 처음 봤어요. It’s my first time seeing you act so rashly. 최우석: 가치 있는 일을 위해선 때론 무모한 것도 필요한 거죠. There’s a need to be like this for a cause that is worthy. 이여원: 시온군 때문에 원장님이 위험해 질 수도 있어요. 애초부터 이 사안은 시온군 문제가 아니라 파워게임이었으니까요. Because this game has always been about power, not Si-On. 최우석: 전 그런 거 잘 모르잖습니까. You know I don’t know about that stuff. 이여원: 아셔야 해요. You must know. 다들 원장님을 끌어 내리려고 혈안이 돼 있어요. Everyone is trying to get you down from your position. 최우석: 원장직 물러나도 전 여전히 의사입니다. I’m always going to be a doctor. 이여원: 정말 벽에 대고 말하는 것 같네요. It seems as if I’m really talking to a wall.